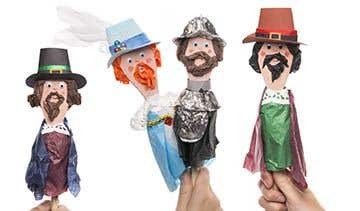 Make a Guy Fawkes puppet with other characters to perform the dramatic story of the Gunpowder Plot. 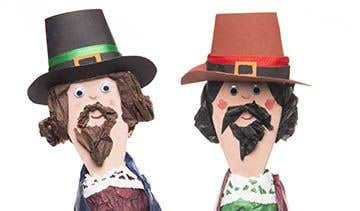 To make a Guy Fawkes puppet, paint the top of the spoon in flesh coloured paint and leave it to dry standing in a cup or jar. To make the body, twist a sheet of newspaper (or use a plastic bag) into a long strip then wind it around the top of the spoon handle to make it into a wider shape. Stick masking tape around the newspaper to hold it in position. To cover the body, cut a 10cm x 40cm tissue paper strip for the first layer of clothes. Lightly brush glue over the newspaper body then wrap the tissue strip over the top. Cut a small piece from the edge of a paper doily, glue it around the tip of the body for a lace collar. Cut another piece of tissue paper make a cloak. Glue and fold it around body. Trim around the edges if the clothes need to be shorter. To make the hair, glue strips of tissue paper around the sides of the spoon, with some small strips for the beard and moustache. Leave the top part of the spoon uncovered. Glue wiggly eyes about halfway down the spoon. Draw a mouth and nose and other details to the face with felt pens. To make a hat, cut a 4cm x 12cm strip from coloured paper. Brush a small about of glue over the top of the spoon, then place the strip over the top, with the spoon positioned in the middle. Wrap both ends of the strip around the back of the spoon so they fold at an angle at the sides, glue the ends down on the back. 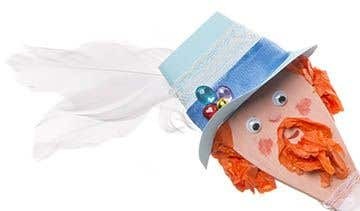 To make a brim for the hat, cut a paper rectangle 4cm x 8cm. Trim the corners of the rectangle to make a long oval shape. Cut out a thin oval-shaped slot in the middle, by cutting in from one of the long sides and making a hole the same length as the base of the hat. Try fitting the brim over the hat, making the slot wider if you need to, then and glue it in position. Glue a thin coloured paper band around the hat with a card rectangle for a buckle. Make other characters in the same way using different coloured papers and tissue. Add gems, ribbon, feathers and threaded beads to embellish the King’s costume. Make the Guard’s helmet and armour from foil or mini foil pie cases brushed with black paint. 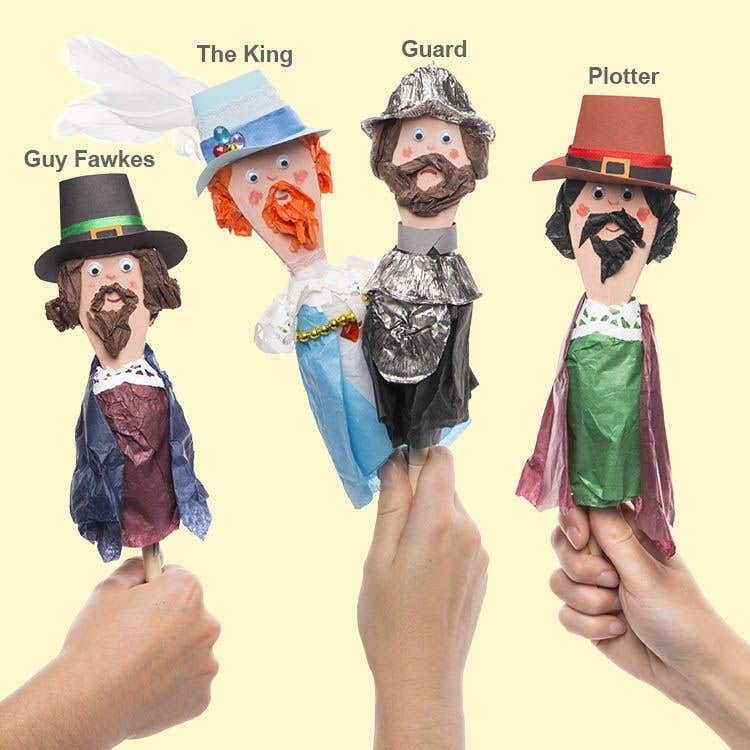 Try making more characters for a classroom project or performance by adding more plotters, guards and king’s courtiers.